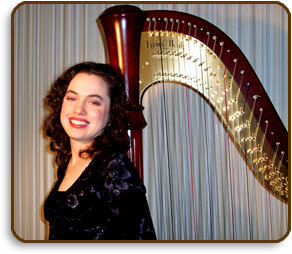 Elegant and graceful, harp music adds a beautiful touch to any event or celebration. Karen has frequently played at weddings, concerts, corporate or nonprofit functions, anniversary parties, funerals, and church services for over 12 years in the Niagara Region and beyond. Karen can perform a variety of music from classical and Celtic to light jazz and pop depending on the type of music you want for your setting. Karen plays solo on pedal or lever harp, or with ensemble, including harp and violin, or harp and voice. Her Celtic ensemble group, Airfid,(Gail Poulsen, Fiddle; Anne Adams, Irish Bodhran; Karen Smith, Harp) has recently recorded a CD, Simple Gifts to benefit Habitat for Humanity Niagara. Please feel free to browse this website and listen to selections from Airfid's latest recording. If you have any questions, you may direct them to Karen at fortysixstrings@yahoo.ca or 289-968-9797. Karen and Airfid thank you for visiting this website. Wishing you all the best as you make plans for your special event!